#BeCrueltyFree- A (potentially) exciting announcement! – Beauty, for good. #BeCrueltyFree- A (potentially) exciting announcement! Hi all! I’m so thrilled to be able to post this info that hit my inbox a few days ago… the Humane Cosmetics Act has re-emerged with new, bipartisan, support and could potentially end animal-testing on cosmetics in the U.S.! If you’re concerned that such progress might limit your collection of beauty goodies, let me allay your fears right now… Presenting, my cruelty-free cosmetics collection! I have a rolling cart of drawers that stores and organizes my collection. The top drawers hold powder and creme eye shadow singles. For no good reason whatsoever, this is where the symmetry of the left and right drawers ends (I may need to reorganize, because now it’s kind of bugging me). Next up, mascaras and under eye products on the left, and blushes on the right. Then, face products (highlights, concealers, etc) on the left and the first drawer of eye shadow palettes on the right. Eye shadow palettes get two drawers (natch) and then we have the lip glosses and balms. 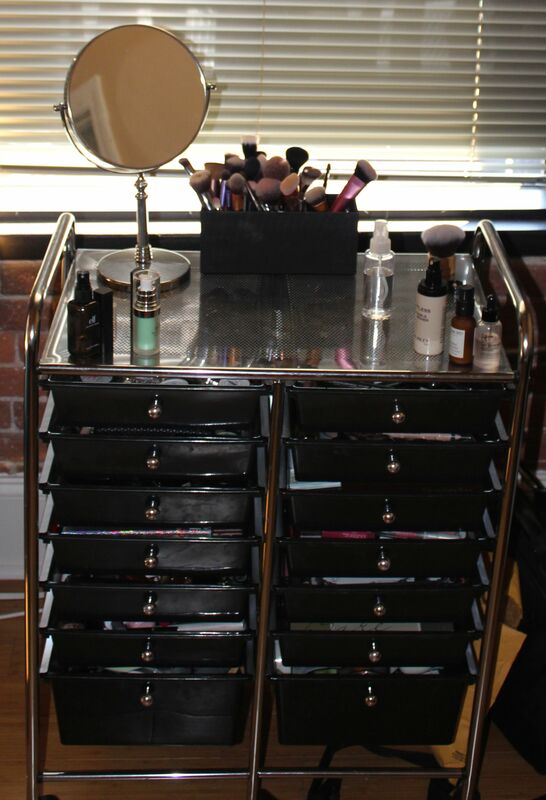 Lipsticks get their own drawer. I also have a disturbing compulsion to stock up during sales, so I have a whole drawer devoted to back up products. Finally, in the deeper bottom drawers, base products and brushes and sponges. Now, I also have a data file wherein I log all of my products with descriptions and other notes/comments. I also have a coding system. Bold means it’s a fave, red means the brand has been acquired by a parent company that animal tests, strike-through means it didn’t work out for me (e.g., shade-wise), italics means I haven’t tried it yet, and green means I liked it, but had to toss because it expired. So, the moral of the story? Don’t fret about the end of animal testing… There is and will be no dearth of fabulous cruelty-free lovelies to make for an embarassingly large collection. Pingback: Moving: The 10th Circle of H-E-Double Hockey Sticks – Beauty, for good. ← Cruelty-free Infinity Dreams Award!